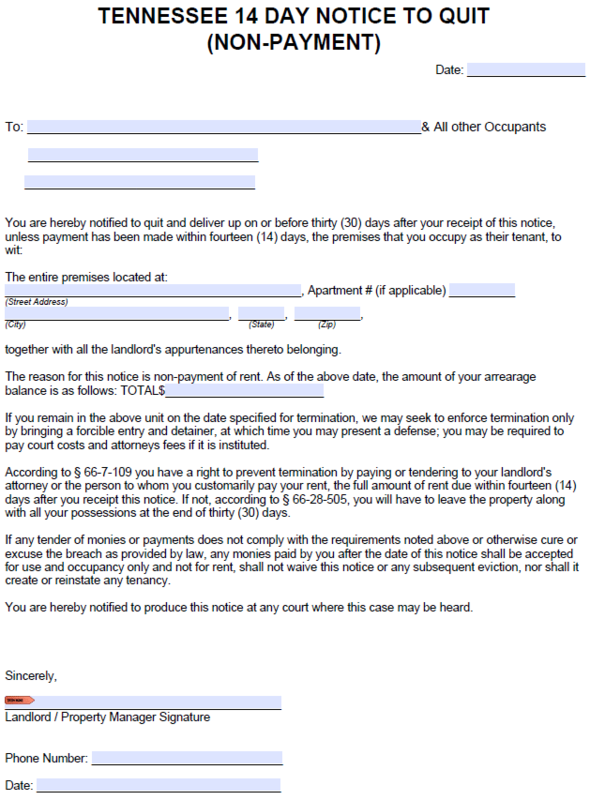 The Tennessee fourteen (14) day notice to pay or quit is used when a tenant fails to pay rent. The full notice period is technically thirty (30) days, however the tenant must make the overdue payment within 14 days of receiving the notice. If the tenant does not pay rent within the 14 day period, the landlord can file an eviction action in court, but only after 30 days have passed since serving the notice on the tenant. Note: In counties operating under URLTA, the 30 day grace period is not applicable. Failure on the tenant’s part to pay rent after being served a 14 day eviction notice will result in the termination of their rental agreement.